Cooking is an activity that a lot of people engage in every day. Whether one cooks to relax and unwind or simply to have something to eat, one should be aware of the risks involved in cooking. The fact is that a majority of home structure fires reported to U.S. fire departments every year are caused by cooking equipment accidents, and that’s according to the National Fire Protection Association. Between 2007 and 2011, these fire departments responded to an average of 156,600 residential property fires involving cooking equipment per year. The accidents caused an average of 400 civilian deaths, over 5,000 injuries, and more than $853 in direct property damage. The NFPA further notes that unattended cooking is the largest contributing factor in these types of fires. When people leave their cooking unattended, temperatures can reach very high levels, causing the food to ignite. Take note that around 67% of home cooking fires start with the ignition of food and other cooking materials. 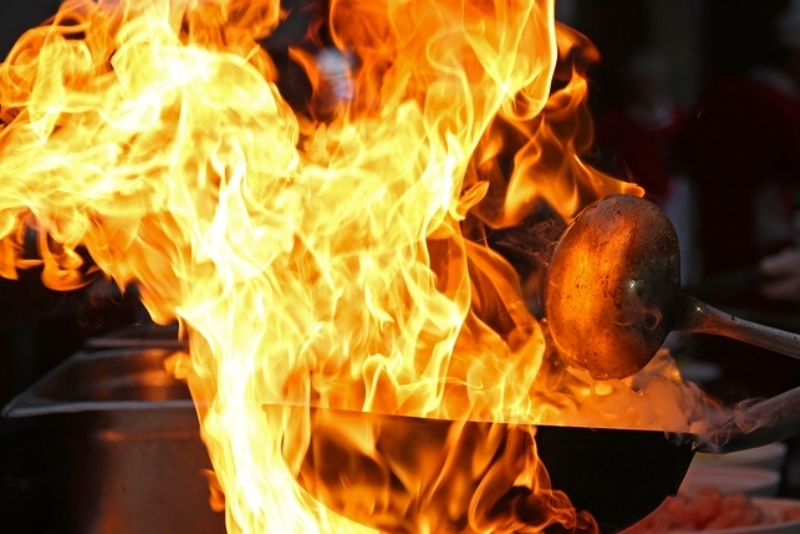 One of the most common types of fires that can occur during cooking is a grease fire. Grease fires can happen when the grease on the pan, as well as grease that has splashed on the stove’s surfaces, ignites due to high temperatures. It is very dangerous because the grease serves as a fuel source for the fire. Moreover, because grease comes in liquid form, it can get splashed easily and spread the fire very quickly. Make sure to adhere to the following tips for the safe extinguishing of such fires. Don’t use water – Doing so can result in severe burn injuries and cause the fire to spread. The water will settle at the bottom of the pan, but it will evaporate very quickly because of the superheated conditions. The evaporation can cause the burning grease to splash in all directions, spreading the fire in an explosive fireball. Don’t carry the pan to the sink or outdoors – The burning grease can splash around, and you could set yourself on fire as a result. Turn off the burner, and cover the pan – The quickest way to extinguish a grease fire is by turning off the heat source and smothering the fire by depriving it of oxygen. Simply turn the stove off, and cover the grease fire with a pan lid. Use baking soda – Sodium bicarbonate or baking soda can also be used to suffocate the fire. It is important to note, however, that you should never use similar-looking products like flour and sugar to smother a fire. These baking ingredients are flammable and can make the fire worse. Use a fire extinguisher – Dry chemical fire extinguishers, which use powder-based agents like sodium bicarbonate, are also effective against grease fires. The most appropriate type of fire extinguisher for fat and oil fires, however, is the wet chemical class K fire extinguisher, which is usually used in professional kitchens. With the right knowledge, you can avoid serious injuries and costly property damage from grease fires. If you need help restoring a portion of your kitchen that has been damaged by a cooking fire accident, please call All American Cleaning at 866-707-8006. Our service area includes the city of Idaho Falls and surrounding communities in Southeast Idaho.